Propane Gas cylinders are a convenient way to heat your home especially if you have limited space to install a bulk tank. Two, four or even six cylinders can be attached to an automatic changeover regulator which will provide an uninterrupted supply to your home. A changeover regulator will automatically swap from an empty cylinder in use to a new one you have standing ready, an indicator on the regulator lets you know when the first cylinder is empty and that you need to order a replacement cylinder, this gives us plenty of time to deliver your replacement cylinder without ever running out. LPG cylinders have many uses within the workplace. 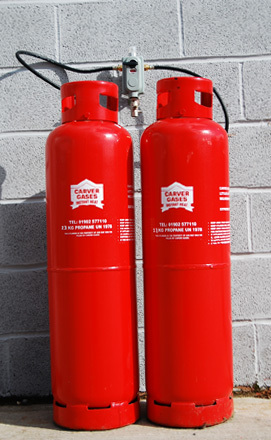 Carver Gases can offer you a reliable and competitive service for the supply of LPG cylinders. You can either order as and when you require, or you may request a standing order where we will deliver to you automatically and swap over any used cylinders. 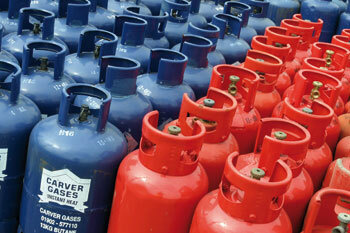 LPG is a cleaner fuel with less fumes compared to oil when use for space heating. LPG is a popular and widely used fuel for Forklift trucks, there are many advantages to using LPG against Diesel or Battery power. Battery trucks require a specific high power electricity supply to be installed to allow recharging. LPG cylinders are used extensively within the catering industry, and no outdoor event would be complete without outside catering. Hot dogs, burgers, baked potatoes, fish & chips and the occasional outdoor curry usually have LPG to thank for their cooking. 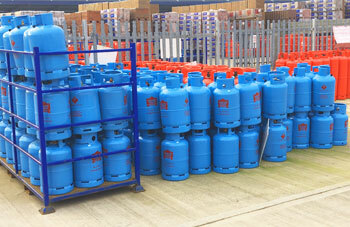 Normal sizes used in the catering industry are 18kg Propane and 11kg Propane cylinders. Butane is sometimes used in summer months but cannot be used in winter as Butane cylinders can only produce gas above -2c, even above this temperature butane may not produce enough vapour on colder days.